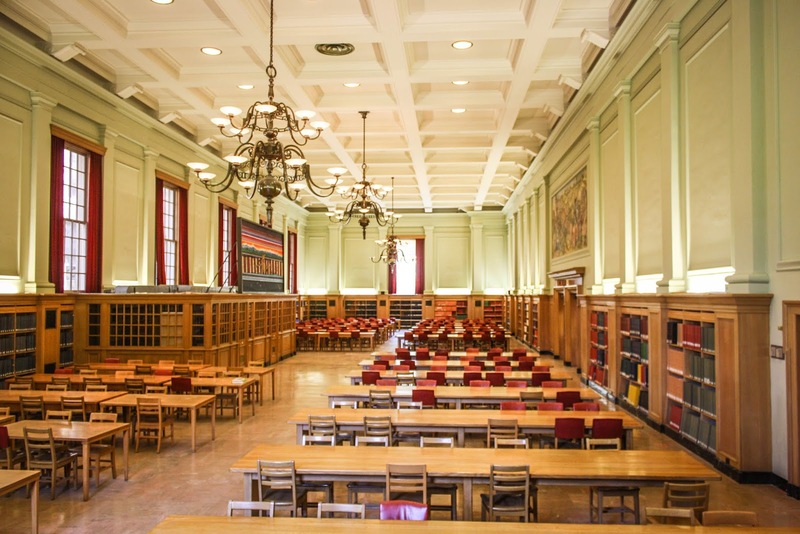 The Rutherford Reading Room, aka "Harry Potter Room"
The Rutherford Library will hold a special 2-day contest to celebrate July 31st, which is Harry Potter's birthday. 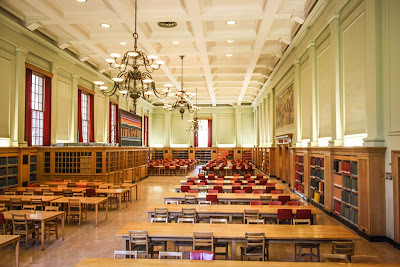 Those familiar with campus culture will know that Rutherford Library's historical architecture and treasured reading room has, over the years, been affectionately been renamed by this latest generation of students as the "Harry Potter Room"
With its high ceilings and chandeliers, the reading room truly does resemble descriptions of the 'Great Hall' at Hogwart's School of Witchcraft and Wizardry - as written by author J.K. Rowling in her seven-volume book series featuring a young orphaned wizard who attends a magical boarding school. In Harry Potter and the Philosopher's Stone, on July 31, his 11th birthday, Harry learns that he is in fact a wizard, and that he will attend Hogwarts to learn the magical arts. Starting on July 30 at 12 noon to 5pm on July 31 a special snapchat filter will be available just in Rutherford South library. Those who capture a selfie snap with the special filter and Tweet it at UAlberta Libraries on Twitter at @uofalibraries will be entered to win 1 of 4 Harry Potter notebooks. The Libraries also has a great many Harry Potter related materials in the library collection for students and staff to enjoy. 1. CONTEST: The “Harry Potter Snapchat | Twitter” Contest (the “Contest”) is conducted by The Governors of the University of Alberta (“UAlberta”) and administered on behalf of UAlberta by the University of Alberta Libraries (“UAL”). The Contest is for UAlberta students, UAlberta staff and members of the public. Participants are required to take a selfie snap using the custom "Have you seen this Wizard" geo-filter in Snapchat, in the Rutherford South Building on July 30-31. Participants must tweet their snaps using Twitter to the handle @uofalibraries for the opportunity to enter the contest, in accordance with the eligibility criteria as set out in these Official Rules. You are not eligible for the Contest if you are a resident of Quebec or if you are an employee of UAL, including a member of the immediate family (defined as mother, father, brothers, sisters, sons, daughters and husband or wife, regardless of where they reside) or household of any of the above persons, their respective affiliates, agents, licensors, associates or representatives. All decisions regarding eligibility to enter this Contest and the Entry Forms will be determined by UAlberta its sole discretion. This Contest is void where prohibited by law. 3. NUMBER, APPROXIMATE VALUE OF PRIZE AND CHANCES OF WINNING: There are four(4) prizes available to be won in this Contest (a “Prize”; collectively “Prizes”). The Prizes are described in paragraph 9 below. The chances of winning a Prize will depend on the number of Eligible Entrants received in accordance with these Official Rules during the Entry Period as defined herein. 4. CONTEST SCHEDULE: This Contest commences on Monday, July 30, 2018 at 12:00 p.m. (Edmonton Time) and closes on Tuesday, July 31, 2018 at 5:00 p.m. (Edmonton Time) (the “Entry Period”). Tweets received by UAL before the contest closing time, which is Tuesday, July 31, 2018 at 5:00 p.m. (Edmonton Time) (the “Contest Closing Time”) to be eligible to win a prize. a. Participants are required to take a selfie snap using the custom "Have you seen this Wizard" geo-filter in Snapchat. The custom geo-filter will be available only in the Rutherford South Building on July 30-31 during the contest schedule. Participants then tweet their snaps using Twitter to the handle @uofalibraries for the opportunity to enter the contest. Each Eligible Entrant may only enter the Contest once. Once submitted, all entries become the property of UAlberta and will not be returned. All entries will be reviewed, and any tweets which are deemed to be late, illegible, incomplete, inaccurate, inappropriate, offensive, plagiarized, subject to copyright or other intellectual property considerations, do not meet the Alberta Freedom of Information and Protection of Privacy Act (“FOIPP”) or privacy considerations, as set out in paragraph 19 herein, and otherwise, or which are deemed to not enhance the reputation of UAlberta, will be disqualified. The determination of whether an entry is illegible, incomplete, offensive, late, or deemed not to enhance the reputation of UAlberta will be in the sole discretion of UAL. 6. PRIZE DRAW DETAILS: The draw will take place on Wednesday, August 1, 2018 at 1:00 p.m. (Edmonton Time). The Eligible Entrants who’s entries are drawn at random and have complied with these Official Rules, including without limitation the provisions of paragraph 8 will be declared a Winners. If necessary, should a Prize be unclaimed, or should a Winner be unwilling, unable or ineligible to win the Prize as set out in these Official Rules, the Prize will be forfeited and UAlberta shall have the right, but not the obligation, to draw, as replacements only, an additional prize winner(s). All participants (including without limitation Eligible Entrants and Winners) must comply with these Official Rules. The determination of the Winners by UAlberta is final and binding. No communication with Eligible Entrants will be entered into except with the Winners which will be selected in accordance with these Official Rules. All matters related to the Contest and the verification of the eligibility of the Eligible Entrants and Winners will be conducted by UAlberta, or by persons designated by UAlberta in its sole and absolute discretion. All decisions made by UAlberta in this regard are final and binding and cannot be challenged. 7. NOTIFICATION: UAlberta will notify the Winners via direct message on Twitter by 2:00 p.m. (Edmonton time). UAL will contact the Winners using the information provided by an Eligible Entrant with the Entry Form. If a Winner does not contact UAL by Friday, August 3, 2018 at 5:00 p.m. (Edmonton Time), UAL shall have the right, but not the obligation, to select an alternative Winner. Once these requirements have taken place, the Eligible Entrants will be declared the winners (the “Winners”). Winners will be contacted via Twitter. 9. PRIZE: There will be four(4) Prizes, all of which are blank paperback Notebooks with covers that feature Hogwarts Houses from the Harry Potter books, each valued in the amount of $10.00 (CDN). The total value of all Prizes is $40.00. The Prizes are not transferable and must be accepted as awarded with no substitutions, except at the UAlberta’s sole discretion. UAlberta reserves the right to substitute the Prize of equivalent monetary value if UAlberta is unable to award the Prize as described. UAlberta will not be responsible, however, if factors beyond the UAlberta’s reasonable control prevents the Prize from being fulfilled. In any such event, the Winners will not be provided with a substitute prize or cash equivalent. The Prizes will only be granted to the verified Winners. The Winners of the Prizes will be required to pick up the Prizes in person at UAL, located in Rutherford Library. Prizes will not be mailed or shipped. 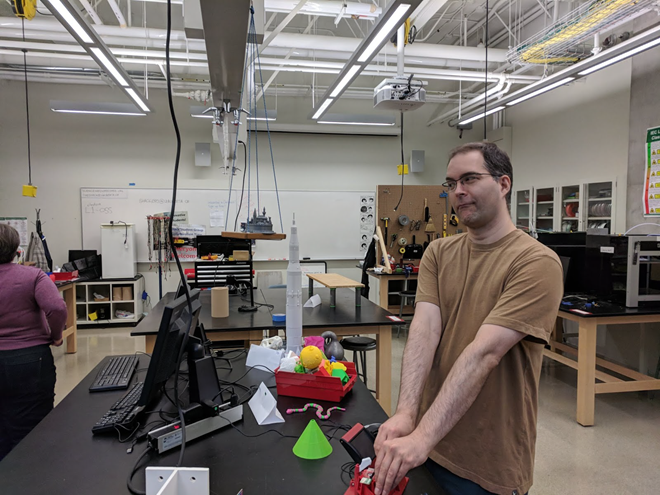 This July you will see some familar faces in the Faculty of Science and the Physics Department's Science Hardware Space: The Shack* (The Shack) as the Cameron Library Public Service Assistants (PSAs) will be covering The Shack's staff vacation leaves. 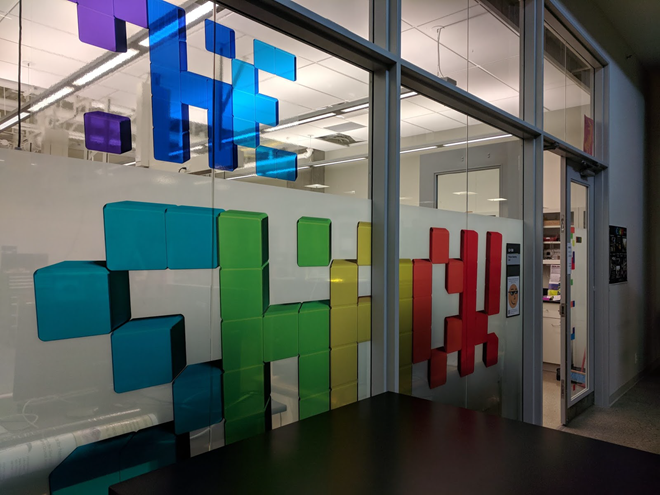 The Shack is located at L2-136 in the Centennial Centre for Interdisciplinary Science Building - pop by and say "Hello!" The open hours are Monday to Friday 1:30 - 3:30 PM for the month of July. 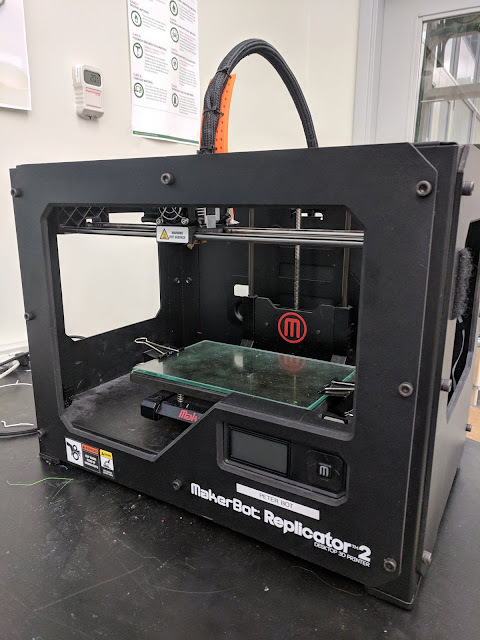 But why would staff from the library be staffing a 3D printing makerspace? Back in winter term 2016, The Shack partnered with Cameron Library to provide 3D printing at the library. 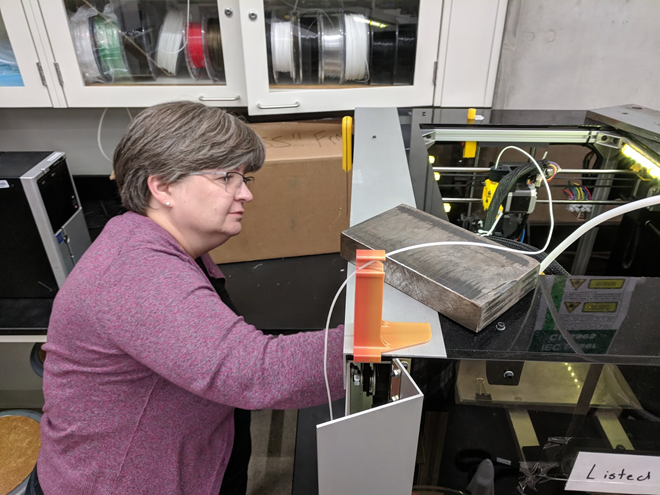 In this unique partnership, The Shack services the five 3D printers that are housed in Cameron Library when advanced technical issues arise. In turn The Cameron Library PSAs underwent training in evaluating 3D models and executing the models prints. Together, its been a productive match! 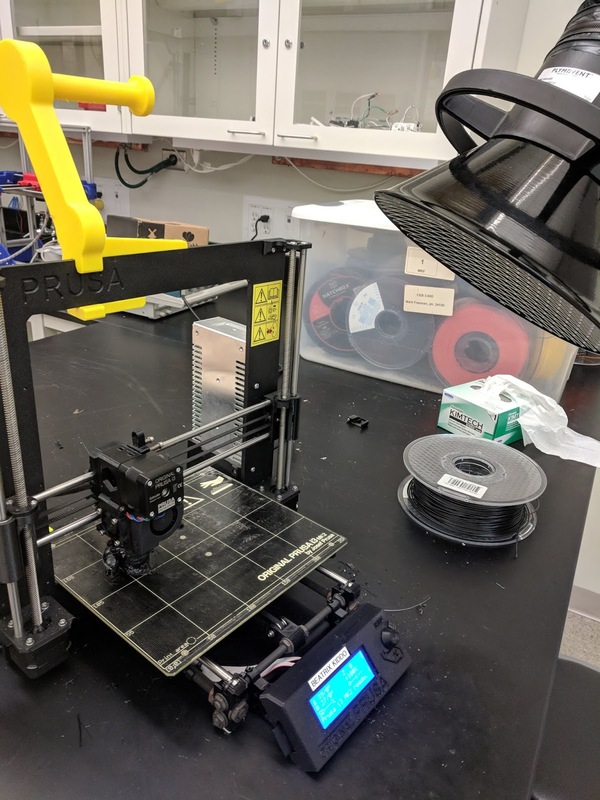 Over the past two years, Cameron Library PSAs have worked with the University of Alberta community on their 3D modeling and printing. This has resulted in an award winning library service for the campus community. 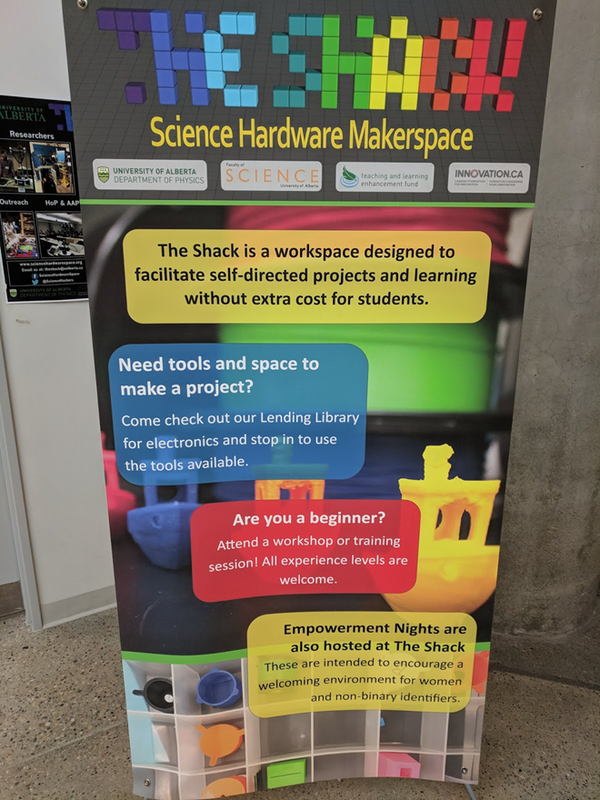 When The Shack's staff vacations looked like they would have to have the Makerspace close for a whole month they turned to the Cameron Library for help. For the month of July you will see PSAs from Cameron Library staffing The Shack. 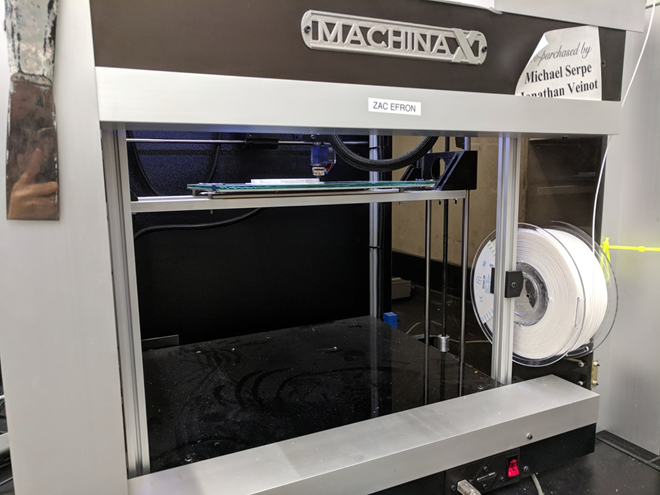 In addition the MachinaX printers, the Cameron Library PSAs will be learning more about The Shack's other 3D printers Prusia and Makerbot.